As the new US administration mulls scaling back America's global role, China is actively seeking to increase its influence in the UN's peacekeeping operations. Speaking to Sputnik, experts explained why Beijing is looking at peacekeeping as an important stepping stone in China's efforts to achieve global leadership. Next week, Antonio Guterres, the UN's next Secretary General, will visit Beijing for talks with Chinese leaders. The former Portuguese prime minister, set to succeed Ban Ki-moon when the latter steps down at the end of the year, is expected to be lobbied by Beijing on increasing the country's role in UN peacekeeping operations, possibly including giving China the chair of the UN department of peacekeeping operations, which for decades has been dominated by Western countries. Earlier this week, a piece in the Financial Times explained that China's growing participation in UN peacekeeping operations is expected to give Beijing "more clout" in the organization, while providing it a greater voice in regions of interest, like Africa, and more influence in the settlement of major regional conflicts, like the one in Syria. China already contributes the largest peacekeeping force among the five permanent members of the UN Security Council, fielding about three thousand of the nearly one hundred thousand UN troops. Beijing is also contributing to nine of the UN's sixteen peacekeeping missions in Africa, and two missions in other regions. The country is the second-largest source of funding for UN peacekeeping, after the US, providing about $8 billion, or just over 10% the organization's total budget. Last year, President Xi Jinping vowed to more than double China's contribution, placing about eight thousand personnel at the UN's disposal. Beijing also promised to train two thousand foreign peacekeepers, and has allocated $100 million to the peacekeeping forces of the African Union. Chinese international relations specialist Victor Gao told FT that China's UN efforts are aimed at replacing "Pax Americana" as the force responsible for the maintenance of global stability with the combined forces of the UN. The analyst also stressed that "if eventually peacekeeping needs to be dispatched," the world might even see UN soldiers in war-torn countries like Syria or Yemen. Speaking to Sputnik, political analyst Vladimir Yevseyev, deputy head of the Institute of CIS Studies, an influential Moscow-based think tank, explained that given China's considerable contribution to the Blue Helmets, it's only natural that Beijing would like to influence policy in this area. In this sense, Antonio Guterres' visit to Beijing next week is seen as a chance for Beijing to declare their wish to head the UN department of peacekeeping operations. "The UN Department of Peacekeeping Operations is important for China," the expert noted. "This is especially true given Beijing's active involvement in peacekeeping operations in Africa, as well as their desire to enter the Middle East, to strengthen their role in the Syrian settlement, and to establish military bases in the region." Furthermore, Yevseyev pointed out that in addition to its efforts at the UN, the recent "adoption of legislation allowing the use of China's armed forces outside its national borders to protect the country's economic interests and to fight against international terrorism also reflects China's growing role as a global peacemaker." "All this suggests that China is gradually becoming a global center of power, and that for this it needs a certain underpinning," the analyst stressed. "I think that for China, the post at the UN is important in terms of the struggle for global leadership. China will do everything it can to ensure that things turn out the way they would like them to." Jia Lieying, Peking University director of the Institute of International Relations, recalled to Sputnik that China has been steadily increasing its activity in the UN's peacekeeping operations for years now. 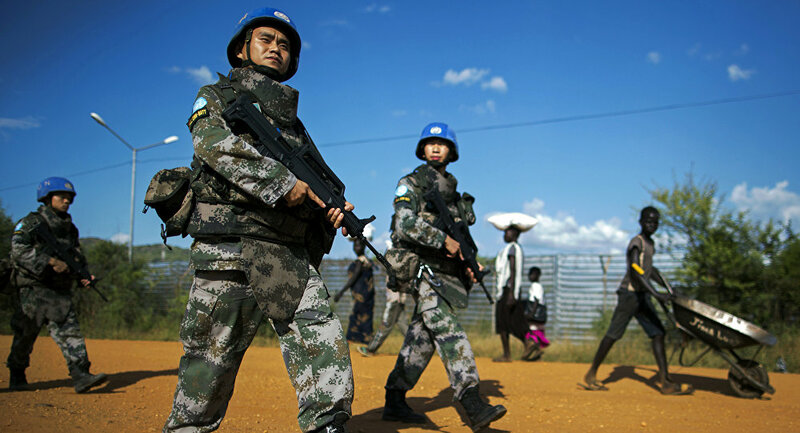 "China has already participated in 30 peacekeeping operations involving the use of about 30,000 peacekeepers. Now, over 3,000 Chinese blue helmets participate in 11 peacekeeping operations. China is the second largest contributor to the UN peacekeeping fund, providing for 10.2% of the budget; only the US provides more." Accordingly, Jia stressed, "we can see that China, as a responsible power in the world, is playing a leading role in the UN in this area. At the same time however, in all this time, only two Chinese commanders have been appointed to command UN peacekeeping missions – in 2007, when Zhao Jingming led peacekeeping operations in Western Sahara, and from 2011 to 2014, when Lieu Chao commanded the operations in Cyprus." This is an inequity that needs to be redressed, the analyst suggested. "China's role in UN peacekeeping can be strengthened in a number of ways. One of them is the provision of more material resources to peacekeeping missions. Another trend is increasing the professionalism and moral-volitional qualities of peacekeepers." Ultimately, Jia suggested that perhaps the most important benefit of China's growing role in UN peacekeeping was Beijing's approach to foreign policy more broadly, which differs from that of Western countries. "Chinese peacekeepers strictly adhere to the UN Charter, and are against the practice of forced intervention. China is guided by the concept of peaceful development, not Western ideas of 'democratic peace', and defends the development and peaceful transformation of nations' socio-economic structures." Accordingly, with Beijing apparently seeing UN peacekeeping as a tool for preserving global peace and stability, and opposed to ideologically-driven interventionism, its growing peacekeeping role should assist in the creation of a safer world based on respect for nations' sovereignty.